Butter garlic sauce is a very simple pasta sauce. It is a great alternative for when you’re sick of your tomato sauces and when alfredo sauce is going to be too rich. This recipe is actually very similar to the one for garlic butter (no surprise, right?) but the preparation is slightly modified. Once again, feel free to use additional spices or even throw in some lemon juice. Or not. Sometimes simple is better. Bring a small saucepan to medium heat, and begin melting a third of a cup of butter. Chop or crush two or three garlic cloves while you’re waiting for the butter to melt. Once the butter melts, add your garlic and saute for three to five minutes. Optional: Add a teaspoon of basil and two teaspoons of oregano. Fresh or dried both work fine. Pour over pasta. You’re done. Never pre-cook this sauce. It’s mostly butter. Once it dries it’s pretty much just weird and terrible. Be careful not to burn the butter. You’d be surprised how bad garlic and butter can taste when you burn them. 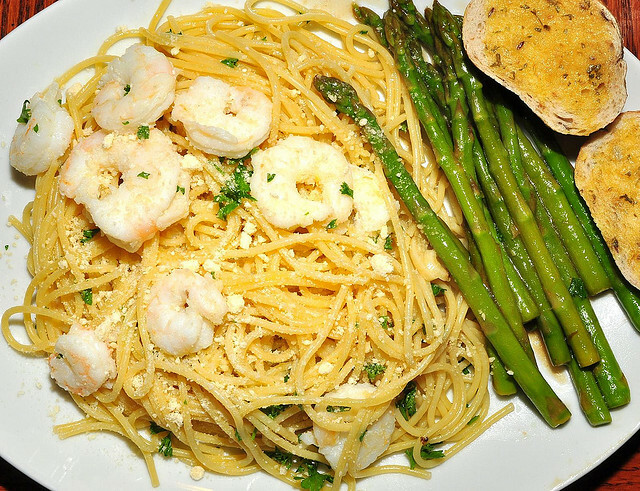 Serve over fresh homemade pasta and top with garlic shrimp or lemon garlic broccoli. Because those are all delicious things. Or you can just serve it with asparagus. That’s good too. do you have a JOB.